Central and local government are working towards a zero waste economy and reducing landfill to meet stringent targets to comply with European Union regulations. The EU Landfill Directive, states that all Member States must reduce the amount of biodegradable municipal waste (such as food and garden waste, and paper and paperboard) sent to landfill by 75 per cent of that produced in 1995 by 2010 and 35 per cent of that produced in 1995 by 2020. EU member states may be subject to penalties from the European Commission if they fail to meet their targets. 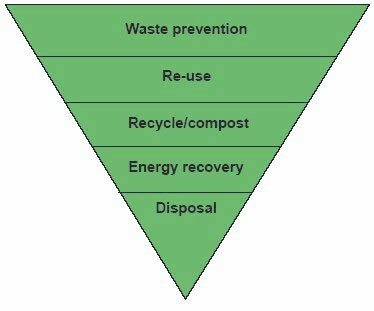 Under the principle of the five step waste hierarchy, as set out in the European Waste Framework Directive, Member States are required to consider five criteria with the prevention of waste as the highest priority, followed by preparation for re-use, recycling, recovery of other value (eg, energy), with disposal as the least desirable option. The Department for Environment and Rural Affairs’ (Defra) position is that it is up to local authorities to make decisions on the most appropriate form of collection of the waste streams.